Introducing the Smart Station Laptop and Tablet Tray from Villacera. Now you can be more productive IN BED. Take your laptop, tablet, even your phone with you to get a little more time on your most critical projects, or your favorite social media site. Knock out that last homework assignment before calling it a day, or put the finishing touches on that sales presentation. The Villacera Smart Station has everything you need in one convenient tray, perfect for the bed, the couch, or your favorite lounge chair. Just look at all these features, and you will see that Villacera has thought of everything! Constructed of sturdy ABS plastic with tungsten reinforced legs. Can be used indoors or out (Not for wet or damp weather). Foldable and portable, easy to take with you, or store away when not in use. Table top dimensions: 20.5" x 13"
Size fully opened: 22" x 13" x 15.75"
Size completely folded: 11" x 13" x 2"
►CONVENIENT SIZE: Table top dimensions: 20.5" x 13", Size fully opened: 22" x 13" x 15.75"
►FOLDS DOWN COMPACT: Foldable and portable, easy to take with you, or store away when not in use. Adjustable height. 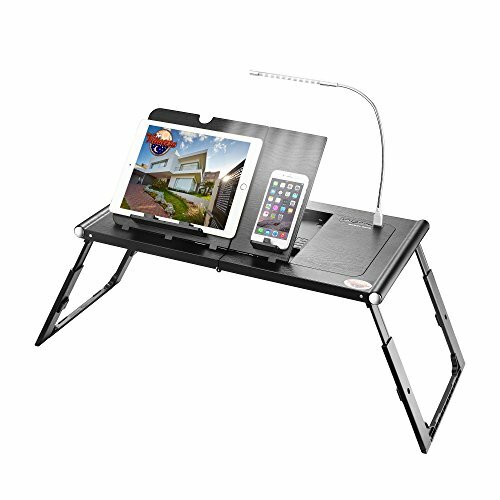 Size completely folded: 11" x 13" x 2"
►ADJUSTABLE: Table top tilts from 0 to 90 degrees to match your comfort needs. Tungsten steel reinforced legs make this table sturdy enough for your laptop. If you have any questions about this product by Villacera, contact us by completing and submitting the form below. If you are looking for a specif part number, please include it with your message.